Lunch begins at 12:00 p.m.
Boat tour from 1:00 p.m. – 3:00 p.m.
Join the Nature Conservancy of Canada (NCC) and partner Queen’s University for lunch and a shoreline tour in beautiful Frontenac Arch. 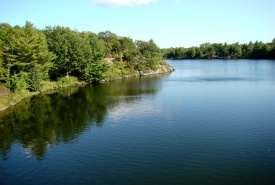 We’ll explore Benson Lake in pontoon boats and see the magnificent shoreline! NCC has been working in the area since 1986 and has some exciting future plans in the beautiful and diverse Frontenac Arch Natural Area. Don’t miss this opportunity to experience these rugged, wild landscapes. This event is open to our Leaders in Conservation. Become a Leader in Conservation today! Our Leaders in Conservation support critical conservation work in Ontario through the gift of an annual contribution of $1,000 or more. Leaders' donations provide NCC with a reliable source of funding that allows us to undertake new projects and to develop the innovative approach to conservation for which we are widely recognized.